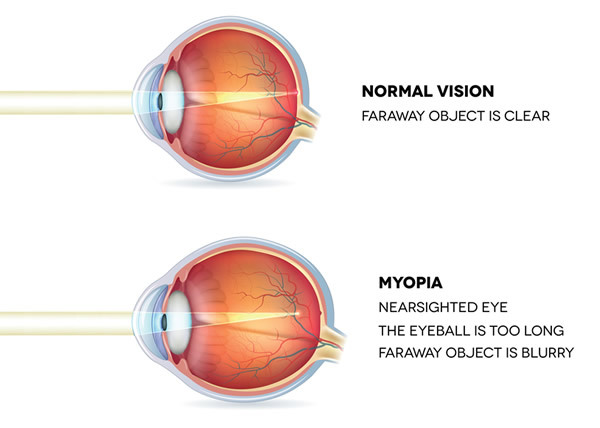 Myopia affects about 30% of the population in the United States. To understand myopia it is necessary to have a basic knowledge of the main components involved in the eye’s focusing system: the cornea, lens, and retina. The cornea is a tough, transparent, domeshaped tissue that covers the front of the eye (not to be confused with the white, opaque sclera). The cornea lies in front of the iris (the colored part of the eye). The lens is a transparent, double-convex structure located behind the iris. The retina is a thin membrane that lines the rear of the eyeball. Light-sensitive retinal cells convert incoming light rays into electrical signals that are sent along the optic nerve to the brain, which then interprets the images. In people with normal vision, parallel light rays enter the eye and are bent by the cornea and lens (a process called refraction) to focus precisely on the retina, providing a crisp, clear image. In the myopic eye, the focusing power of the cornea (the major refracting structure of the eye) and the lens is too great with respect to the length of the eyeball. Light rays are bent too much, and they converge in front of the retina. This results in what is called a refractive error. In other words, an overly focused, fuzzy image is sent to the brain. By far the most common, physiologic myopia develops sometime between the ages of five to 10 years and gradually progresses until the eye is fully grown. This may include refractive myopia (cornea and lens-bending properties are too strong) and axial myopia (the eyeball is too long). Pathologic myopia is a far less common abnormality. This condition begins as physiologic myopia, but rather than stabilizing, the eye continues to enlarge at an abnormal rate (progressive myopia). This more advanced type of myopia may lead to degenerative changes in the eye, or degenerative myopia. Acquired myopia occurs after infancy. This condition may be seen in association with uncontrolled diabetes and certain types of cataracts. Antihypertensive drugs and other medications can also affect the refractive power of the lens. Myopia is considered to be primarily a hereditary disorder, meaning that it runs in families. People are generally born with a small amount of hyperopia (farsightedness), but as the eye grows this decreases and myopia does not become evident until later. Because of this, it is sometimes argued that myopia is not inherited, but acquired. 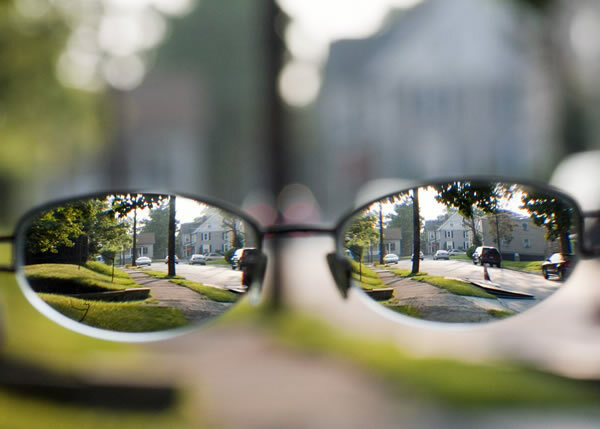 Some eyecare professionals believe that a tendency toward myopia may be inherited, but the actual disorder results from a combination of environmental and genetic factors. Environmental factors include close work, stress, and eye strain. The diagnosis of myopia is typically made during the first several years of elementary school when a teacher notices a child having difficulty seeing the chalkboard, reading, or concentrating. The teacher or school nurse often recommends an eye exam by an ophthalmologist or optometrist. An ophthalmologist—M.D. or D.O. (Doctor of Osteopathy)—is a medical doctor trained in the diagnosis and treatment of eye problems. Ophthalmologists also perform eye surgery. An optometrist (O.D.) diagnoses and manages and/or treats eye and visual disorders. In many states, optometrists are licensed to use diagnostic and therapeutic drugs. A patient’s distance vision is tested by reading letters or numbers on a chart posted a set distance away (usually 20 ft, or 6 m). The doctor has the patient view images through a variety of lenses to obtain the best correction. The doctor also examines the inside of the eye and the retina. An instrument called a slit lamp is used to examine the cornea and lens. The eyeglass prescription is written in terms of diopters (D), which measure the degree of refractive error. Mild to moderate myopia usually falls between -1.00D and -6.00D. 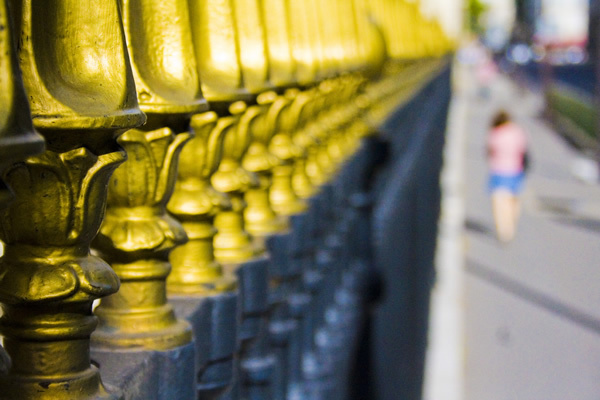 Normal vision is commonly referred to as 20/20 to describe the eye’s focusing ability 20 ft away from an object. For example, 20/50 means that a myopic person must be 20 ft away from an eye chart to see what a normal person can see at 50 ft (15 m). The larger the bottom number, the greater the myopia. Vitamin A: essential vitamin for healthy eyes. Ginkgo extract: increases blood supply to the eye. It may help prevent deterioration in vision. Some eye care professionals recommend exercises to help improve circulation, reduce eye strain, and relax the eye muscles. The Bates method is a common set of exercises. It is possible that by combining exercises with changes in behavior, the progression of myopia may be slowed or prevented. Alternative treatments include: visual therapy (also referred to as vision training or eye exercises); discontinuing close work; reducing eye strain (taking a rest break during periods of prolonged near vision tasks); and wearing bifocals to decrease the need to accommodate when doing close-up work. Acupuncture, by acting on eye muscles, causes changes in the shape of the eyeball and thus, may be able to correct nearsightedness. Approximately 10 sessions followed by daily eye exercises are needed to see significant and prolonged results. Eyeglasses are the most common method used to correct myopia. Concave glass or plastic lenses are placed in frames in front of the eyes. The lenses diverge the light rays so they focus further back, directly upon the retina, producing clear distance vision. Contact lenses are a second option for treatment. Contact lenses are extremely thin round discs of plastic that are worn on the eye in front of the cornea. Contact lenses offer several benefits over glasses, including: better vision, less distortion, clear peripheral vision, and cosmetic appeal. In addition, contacts don’t steam up from changes in temperature or perspiration. Recommended for people who find glasses and contact lenses inconvenient and uncomfortable, refractive eye surgery improves myopic vision by permanently changing the shape of the cornea so light rays focus properly on the retina. Each of these surgery techniques changes rapidly in price and effectiveness. Patients should investigate the procedures and ask many questions of their doctors or others who have had the procedures before having them done. Radial keratotomy (RK), the first of these procedures made available, is considered the riskiest. The surgeon uses a delicate diamond-tipped blade, a microscope, and microscopic instruments to make several spoke-like, “radial” incisions in the nonviewing (peripheral) portion of the cornea. The slits surgically alter the curve of the cornea, making it flatter, which may improve the focus of images onto the retina. Photorefractive keratectomy (PRK) involves the use of a computer to measure the shape of the cornea. Using these measurements, the surgeon applies a computer-controlled laser to make modifications to the cornea. The PRK procedure flattens the cornea by vaporizing small amounts of tissue from the cornea’s surface. Photorefractive keratectomy can be used to treat mild to moderate forms of myopia. The cost is approximately $2,000 per eye. Laserassisted in-situ keratomileusis (LASIK) is the newest of these procedures. It is recommended for moderate to severe cases of myopia. A variation on the PRK method, LASIK uses lasers and a cutting tool called a microkeratome to form a circular flap on the cornea. The flap is flipped back to expose the inner layers of the cornea. The cornea is treated with a laser to change the shape and focusing properties, then the flap is replaced. Myopia treatments under research include corneal implants and permanent, surgically placed contact lenses. Glasses and contact lenses can (but not always) bring vision to 20/20. Refractive surgery can make permanent improvements for the right myopic candidate. Ophthalmologists continue to improve upon and develop new techniques to correct myopia. Alternative treatments have not been widely studied. Myopia is generally considered a hereditary condition, which means that it runs in families. From this perspective there is nothing that can be done to prevent this disorder. However, because the percentage of people with myopia in the United States has steadily increased over the last 50 years, some believe that the condition results from a combination of genetic and environmental factors. If this is true, then it may be possible to prevent or control myopia by reducing close work, reading and working in good light, maintaining good nutrition, and practicing visual therapy (when recommended). In fact, a 2002 study showed that children’s diets high in starches may be adding to the high prevalence of myopia. Diets high in refined starches from breads and cereals increase insulin levels, which in turn affect development of the eyeball. Increasing protein consumption has been shown to slow the progression of myopia in children. Eye strain can be prevented by using sufficient light for reading and close work, and by wearing corrective lenses as prescribed. 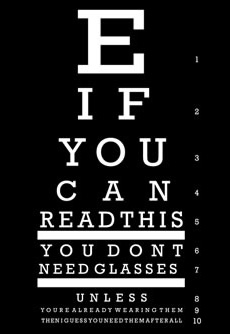 Everyone should have regular eye exams to see if the prescription has changed or if any other problems have developed. This is particularly important for people with high (degenerative) myopia who may be at a greater risk of developing retinal detachments or other problems.